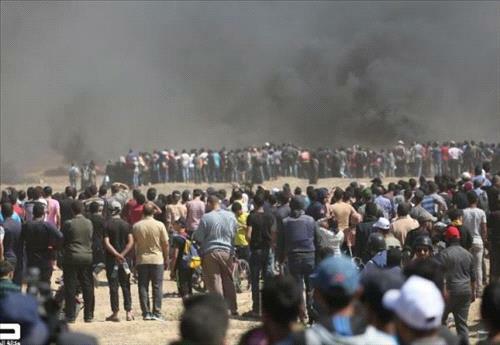 AMMONNEWS - The Minister of State for Media Affairs, Mohammed Momani, on Monday condemned in the strongest terms the Israeli escalation against the Gaza Strip today, which claimed lives of several innocent Palestinians and led to injury of other hundreds. Momani, who is also the Government Spokesperson, blamed Israel, as an occupying power, for the crime committed in the Gaza Strip today. He blasted Israel's use of excessive force against the defenseless Palestinian people, who came out in thousands to express their right to return to their homeland in accordance with their legal, political and humanitarian rights guaranteed by international laws and conventions. On the stalled peace process, he said the continued absence of prospects for a just and comprehensive solution to the Palestinian issue, which guarantees the right to freedom, dignity and a Palestinian state will contribute to entrenching the environment of despair that generates violence. He called for concerted efforts to resolve the Palestinian-Israeli conflict and to meet the rights of the Palestinian people on the basis of the two-state solution, which guarantees the establishment of an independent Palestinian state on the lines of June 4, 1967, with East Jerusalem as its capital. On the Palestinian refugees, he also urged to find a solution to all final status issues, including the refugees' dilemma in accordance with the UN Resolution, 194, and the Arab Peace Initiative, which both call for an agreed solution to the refugee problem. As for Israel's belligerence, he noted Israel's use of excessive force in the face of unarmed demonstrators who exercise their legitimate right to protest against the occupation and demand their legitimate rights on the eve of the Nakba's 70th anniversary is another sign of the illegality of Israeli policies and the threat it poses to regional peace and security. Ending the occupation and resolving the conflict on the basis of the two-state solution is the only way to achieve security and peace for all peoples in the region, the minister affirmed. Momani urged the international community to assume its responsibilities to protect the Palestinian people from Israeli attacks that undermine peace efforts and push the region towards further violence and conflict. Momani also reiterated Jordan's firm stance in condemning the US administration's recognition of Jerusalem as the capital of Israel and its rejection of unilateral steps that violate international law, resolutions of international legitimacy and perpetuate occupation and conflict.